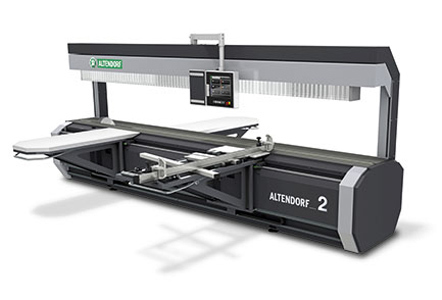 Ligna 2011: Altendorf presents the Altendorf 2 New Dimension Saw. The LIGNA Hannover 2011was held from May 30 - June 3 in Hannover, Germany. As the leading exhibition in woodworking machinery industry among the world, LIGNA provides you the opportunity to outlook the future trends and innovations in the industry. Boasting capabilities way beyond those of a conventional sliding table saw, the Altendorf 2 combines the flexibility of a sliding table saw with the advantages of other solutions for cutting materials to size. Managing Director Andreas Ploeger: "The Altendorf 2 is a completely new machine concept that takes cutting solutions to a new level. With its technical flexibility and ergonomic benefits, the Altendorf 2 will quickly establish its very own fan base. It is a very successful exhibition .Altendorf take the chance to show the new trends and innovations in the field of cutting technology.